Our collection of warm-lined slippers for men and women are perfect for swollen feet that feel the cold. As well as being soft and warm, they’re specially designed to offer good support and stability. They also have a substantial sole that can be worn indoors or out. New for women, we’ve introduced Elise Warm-lined. This cosy bootee has a soft, cushioned footbed that can be removed for extra depth while the broad toe shape gives lots of space for problem toes. 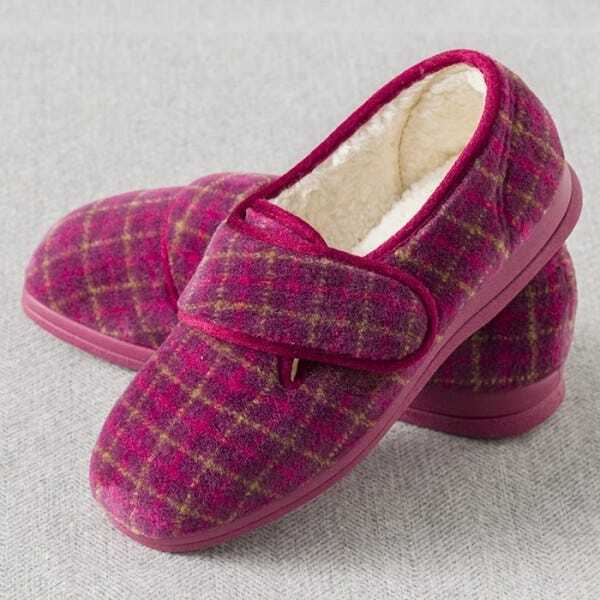 We've also added a warm-lining to Holly, one of our best-selling slippers. An updated version of our Helen style, this supportive slipper now has a cushioned footbed for even greater comfort. The broader toe-shape has more space for swelling and it’s seam-free at the front for sensitive toes, and the touch-fastening strap adjusts to fit a range of swelling. With a warm pile lining to keep feet snug all winter. For men, we have Rudolph and a warm-lined version of Robbie which both offer extra warmth for feet that feel the cold. Rudolph is a luxury, warm-lined slipper - a godsend for feet which feel the cold. The fleeced faux fur lining gives cosy comfort while the faux fur footbed can be removed to give you extra depth. Robbie is a soft, adjustable bootee that will keep feet and ankles warm and supported. Cushioned underfoot for greater comfort, it opens almost to the toe so it’s easy to get on a swollen or bandaged foot. Click here to see our complete range of warm-lined slippers.